A reunited Led Zeppelin and Fleetwood Mac have been named as the frontrunners to headline Glastonbury 2019. Bookmaker’s Betway say that Led Zeppelin are “clear favourites” to top the bill on the Pyramid Stage next year at 2/1, while Fleetwood Mac are currently sitting at 3/1. Betway’s Alan Alger says: “Emily Eavis has previously spoken about her dream of getting Led Zeppelin to headline Glastonbury, and this year the odds suggest there’s a good chance of that becoming a reality at 2/1. There’s been a flurry of activity surrounding the surviving members of Led Zep this year, with the band celebrating their 50th anniversary. How The West Was Won was reissued back in March, while a 7-inch yellow vinyl featuring the Sunset Sound Mix of Rock And Roll and the Olympic Studio Mix of Friends was introduced to mark Record Store Day in April. September 7 sees a reissue of The Song Remains The Same, while an official 50th anniversary photo book will be released in October by Real Art Press. 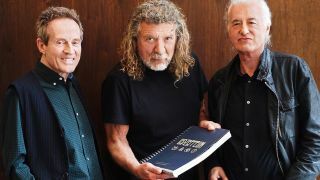 Robert Plant, Jimmy Page and John Paul Jones last played together at the Ahmet Ertegun Tribute Concert in London in 2007 with Jason Bonham taking his late father John’s place behind the drum kit, but Plant has consistently distanced himself from further reunions in the past. Fleetwood Mac, meanwhile, parted ways with Lindsey Buckingham in April and brought in Tom Petty And The Heartbreakers guitarist Mike Campbell and Crowded House leader Neil Finn. They’ll head out on a North American tour later this year, with dates planned into April 2019.